Make sure your airbrushed is cleaned thoroughly between uses using this Spectrum Flow Airbrush Cleaner. This high strength cleaner has been produced specifically to provide a food grade cleaning solution for your airbrush machine and can be used with any type of airbrush machine, not just the Spectrum Flow Airbrush. When you are using your airbrush on a regular basis, paint particles can become lodged in your pen causing it to block and sometimes spit. By simply running Spectrum Flow airbrush solution through your airbrush switching between colours becomes effortless as this Airbrush Cleaner effectively removes all particles of paint. The Spectrum Flow airbrush cleaner is especially good with the ethanol range of paints. With these paints drying out quickly, you may find that the powder can sometimes sit in the bottom of your pen when it is left for a period of time. The Spectrum Flow Airbrushing Cleaning Solution is perfect for clearing this powder and avoiding any blockages. When using liquid shiny or a similar airbrush glaze, you will likely find that it will clog your airbrush pen with regular use as its consistency is often thicker than airbrush paint. Spectrum Flow airbrush cleaner will also remove any glaze that may be stuck in your pen either by running the cleaner through the pen as you would an airbrush paint or by soaking your pen in the cleaner. At the end of your airbrushing session, Airbrush Cleaner will provide a thorough clean and ensure you will never encounter blockages from dried paint. Spectrum Flow Airbrush Cleaner is 100% food safe. Available in 100ml and 500ml. May contain traces of sulphites, soy and nuts. Create amazing airbrushed designs using the Spectrum Flow Airbrush Machine. Please note: The Universal plug comes with an adaptor to fit either UK/EU or USA plug sockets. What Makes the Spectrum Flow Airbrush so Great? Single action for ease of use. Large paint cup – no need to constantly refill. Works with Spectrum Flow colours and all other edible airbrush paints. Can spray both large areas and precise details. Comes with airbrush pen holder. Ideal for both novices and expert decorators. With the Spectrum Flow Airbrush Kit you can create the most colourful, diverse and unique cakes ever seen! It allows you to layer colours, apply precise shading, spray large areas and even create intricate details, not only providing your cake with the very best finish, but also saving you loads of time in the process! Set up of the airbrush is simple, it’s easy to use and clean, and doesn’t leave your hand aching after long periods using it, making it the number one choice for novice and expert decorators alike. 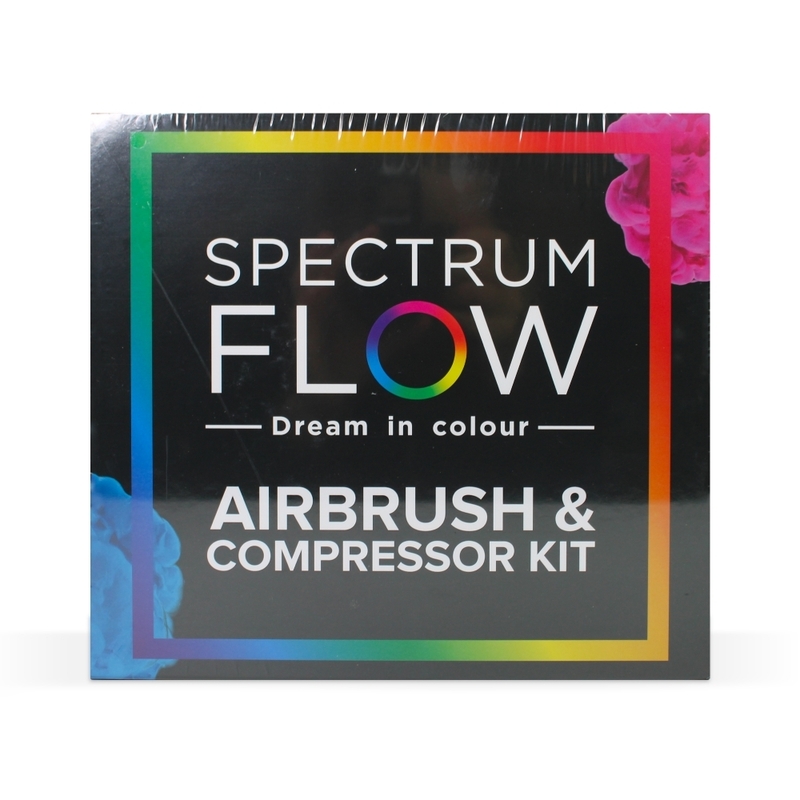 There’s a massive range of Spectrum Flow airbrush colours available for the airbrush machine in matt, pearl and iridescent finishes, (some can even be used to spray onto chocolate!) so you are sure to find the colour you are looking for. Colours can also be mixed to get any shade you want. Stainless steel, single action airbrush pen. With air constantly flowing through the pen, all you have to do is pull back the trigger to release the paint. DC 12V Airbrush compressor with soft touch coating that encases it, making it easy to wipe clean (The colour can get into every nook and cranny if your compressor is not encased). Moisture trap to help prevent blockages. Large paint cup holding up to 20cc, allowing you to spray for long periods without refilling. Pen holder, attached to the compressor, to neatly hold your pen when not using it or changing colours. Dropper to help you mix colours or drop paint into the paint cup. A year warranty is provided as standard. 1. Connect the hose and moisture trap to the airbrush compressor and the airbrush pen. 2. Fill the paint cup with a colour of your choice. 3. Gently pull back the trigger to release the airbrush paint. Airbrushing is a great technique and with very little practice, you can produce fantastic results. Here are just a few helpful tips that are worth remembering. 1. Practice on paper first so that you don’t spoil your project. 2. Never start spraying directly on to your project as you may get a sudden burst of colour. Try instead, to start spraying onto a spare piece of paper first, and then (whilst spraying) guide your spray onto your project. 3. Clean your airbrush with Spectrum Flow Airbrush Cleaner before and after use to prevent potential blockages and between changing colours to prevent colour residue mixing together. 4. Do not overfill the cup and when mixing colours, mix in a different bottle before adding to the paint cup. 5. If also using the airbrush for other crafting purposes, always keep a spare pen, specifically for edible use. DISCLAIMER: We DO NOT recommend using confectioner’s glaze or glitter in your airbrush kit unless using the specifically designed Spectrum Flow glitter paints. If you use confectioner’s glaze or glitter, we are not liable for any damage as this would void the warranty. Spectrum Flow Airbrush Kits are available with either a UK, EU or USA plug. Max PSI: 30PSI LPM - litres per minute: around 9L/MIN The compressor can be left running for a maximum of 60 minutes.